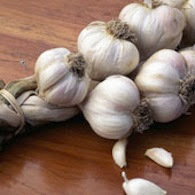 A potent-smelling component of garlic oil may help release protective compounds to the heart after heart attack, during cardiac surgery, or as a treatment for heart failure. Now researchers at Emory University School of Medicine have turned to diallyl trisulfide (right structure), a garlic oil component, as a way to deliver the benefits of hydrogen sulfide to the heart. Their findings suggest that doctors could use diallyl trisulfide in many of the situations where researchers have proposed using hydrogen sulfide.